Here are the answers to some of the questions that we receive most here at Cooper Complete. Take the right supplements for you. Review the Cooper Complete brochures and determine what products are right for you. We have brochures for men and women that highlight vitamins and supplements that may be appropriate for you. The Cooper Complete catalog provides a short description and the supplement facts panel for each product. How are Cooper Complete products formulated? Formulas are developed and revised based on the recommendations of the Cooper Complete scientific advisory team. The team includes Dr. Kenneth Cooper (“father of aerobics” and founder of Cooper Aerobics Center) and physicians and registered dietitians from Cooper Clinic and The Cooper Institute non-profit research organization. 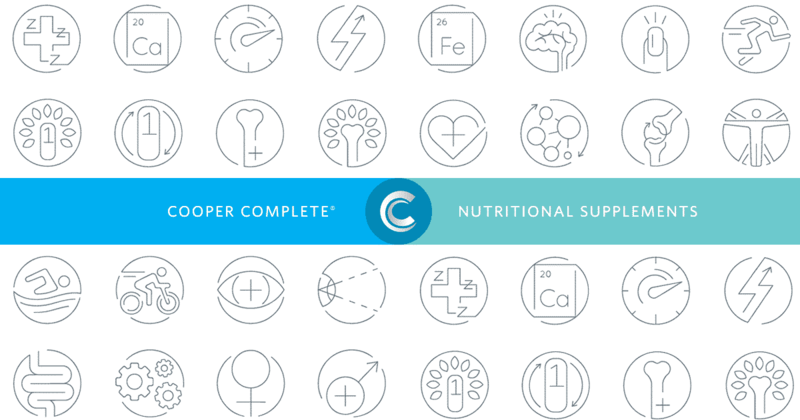 Where are Cooper Complete supplements manufactured? All Cooper Complete supplements are manufactured here in the United States. Are there other supplements I should take in addition to Cooper Complete multivitamins? To maintain cardiovascular health, we recommend that adults take a Cooper Complete multivitamin as well as Cooper Complete Advanced Omega-3 fatty acids (fish oil). In addition, women may also need calcium. Individuals on statin medications may need to take additional coenzyme Q10 (CoQ10). Our original multivitamin formulations contain 50 mg CoQ10, but physicians recommend 100 mg per day, or more, for individuals on statin medications. Does taking a baby Aspirin (81 Mg) or Adult Aspirin (325 Mg) prevent me from taking Cooper Complete vitamins? No. The combined effect of vitamin E and aspirin is not a problem at these dosages. Is Cooper Concepts, Inc., A GMP Certified Company? Cooper Concepts, Inc., which markets Cooper Complete nutritional supplements, is not a Good Manufacturing Practices (GMP) certified company, however, our manufacturing facilities hold these certifications. Do Cooper Complete products include raw materials from China? Raw materials come from around the world, including China. A Vendor Qualification Program is in place to ensure that only product that has been vetted is accepted into the facility. All incoming product is accompanied by a certificate of analysis. The product is quarantined in the manufacturing facility until it undergoes testing to ensure that the product received is in fact as stated and meets guidelines. Can I take Cooper Complete multivitamins and mineral supplements as a prenatal vitamin? It is best to consult your personal physician before taking any supplement. Cooper Complete multivitamin and mineral supplement contains higher levels of the B-complex vitamins than are found in prenatal vitamins. Cooper Complete multivitamin and mineral supplement contains 200 mcg of folic acid, an important vitamin in preventing neural tube defects. Is Beta Carotene in Cooper Complete multivitamins? Yes, vitamin A, the first ingredient on the label, is beta carotene. The FDA specifications for vitamin labels require the ingredients to be listed by the vitamin’s name. Beta carotene is a provitamin to vitamin A and is actually converted by the body into vitamin A. Why isn’t Calcium in Cooper Complete multivitamins? Calcium requirements are dependent upon both gender and age. Because Cooper Complete multivitamins are formulated for men and women, it was best to leave calcium out of the formula. Coenzyme Q-10 (CoQ10), also known as ubiquinone, is found in every cell in the body. Its main function is to serve as a catalyst to convert the food we eat into energy. CoQ10 also acts as a powerful antioxidant. Some studies have suggested that CoQ10 could play a role in protecting the body against tissue damage from congestive heart failure, heart attacks, heart disease, retina deterioration, breast cancer, and a number of other diseases. CoQ10 levels decrease with age. CoQ10 may also be depleted in people who are taking cholesterol-lowering statin drugs. Lutein and zeaxanthin, found in high concentrations of the macula of the eye, are carotenoids that may prevent cell damage by acting as antioxidants in removing destructive free oxygen radicals. Lutein and zeaxanthin are found in dark leafy greens including kale, turnip and collard greens, spinach, corn and egg yolks. Studies show these two carotenoids provide some protection against age-related macular degeneration, the leading cause of blindness in people ages 65 and older. Lutein has also been shown to be beneficial to maintaining skin health. Lycopene is a carotenoid found primarily in tomatoes, red grapefruit, apricots and watermelon. It gives them their red color. Several studies with reported food intake have found that men who eat more tomatoes and tomato products have a lower risk of prostate cancer. Lycopene is also being researched to determine a potential benefit against cancer, coronary artery disease, and macular degeneration. Does Cooper Complete contain natural Vitamin E?